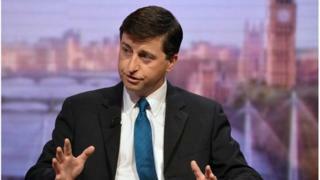 Shadow Foreign Secretary Douglas Alexander has urged all pro-Union parties to agree to a joint approach to Scotland's constitutional future. He said the parties should offer a "shared commitment" to draft a "new vision" for Scotland in the event of a No vote in the referendum. Mr Alexander argued the constitutional debate had become "arid". Nationalists have called on the Unionist parties to offer their plans for Holyrood before the 2014 vote. In a blog post on Labour Hame, the senior party MP made the case for all the parties opposing independence to agree to help form a national convention which could look at the powers of the Scottish Parliament. Mr Alexander re-stated his own opposition to independence, which he claimed runs counter to the concept of forming and retaining close links with neighbours. He said: "Stepping back over the summer from the day-to-day exchanges confirmed to me just how arid (a strong but honest assessment) much of the contemporary constitutional debate has become. In the last year alone we've seen a debate characterised all too often by shallowness, grievance and personal vitriol. "There is a real risk that the vitriol, which at times has infected the debate, will not simply fade post 18th September 2014, and when people look beneath the surface of whatever numbers define the result, it will not be a pleasant view. "Whatever the outcome of the vote, that cannot and would not be good for Scotland." The Shadow Foreign Secretary added: "As a Scottish Labour MP I welcome the response from both the Scottish Conservatives and Scottish Liberal Democrats supporting the idea of a National Convention that I set out back in March. "And so I hope that such a National Convention could become a shared commitment - by those parties who believe that Scotland's better future lies within the United Kingdom. "It would be both an expression of our patriotism and pride in Scotland, and a mechanism by which to translate our sense of possibility for post-2014 Scotland into practical policies." In that context, Mr Alexander said he believed an agreed approach by the parties committed to the Union would be a "tangible answer" to the question of what happens if Scotland votes No to independence. Earlier, he told the BBC's Good Morning Scotland programme: "If there is one certainty it is that after the issue of the independence question is resolved next September there will be discussions about how devolution can be improved. "My plea is that we can actually broaden that conversation, so that we're not just talking about democratic renewal, we are talking about democratic, social and economic renewal. A national convention is a very practical answer." SNP MSP Linda Fabiani said: "Douglas Alexander discussed this same idea earlier in the year, on the anniversary of the 1979 devolution referendum - when a failure to achieve a Scottish parliament delivered absolutely nothing for Scotland apart from 18 years of a Tory government we didn't vote for. "In reality, only a Yes vote in next year's referendum will put Scotland's future in Scotland's hands, giving civic Scotland, the political parties and above all the people the opportunity to build a solid, progressive constitutional platform for an independent Scotland. "The reality is that a No vote is a vote for no more powers - which is one reason why we are confident of achieving a Yes vote next September."